The average water loss in the Danish water distribution network is below 10%. This level is among the lowest worldwide, and reducing the loss of drinking water is a global focus area. Together with DTU, the water suppliers Nordvand and HOFOR and a number of other industry partners, AVK has joined the LEAKman partnership. The purpose is to implement state-of-the-art water distribution by using high-technology products and techniques and by tying components and software together into integrated solutions. The goal is to minimise water loss and an important part of this project is effective tracking and management of leakages. Leif Koch A/S has developed noise loggers for automatic tracking. The leak noise behaves in a special way and can be recognised and distinguished from background noise by a microphone in the noise logger. Listening to the intensity and the frequency of the noise, the logger can identify and locate the leakage. The noise loggers can be programmed to 10,000 listenings at a pre-defined time, typically between 2 am and 4 am when consumption and background noise are at a minimum. The signals will be sent as audio files to the water supply management system. If the logger recognises a leak noise, the audio file will contain a warning, and the water supply can then locate the leakage. Each section of the distribution network is provided with a number of valves in order to be able to isolate a section which is as small as possible in case of pipe bursts or the need for establishing new pipes. The valves are spread across the whole section and thus, it is an obvious opportunity to place the noise loggers together with the valves. The valves are mounted on the pipes, and here they are in contact with the water path. On top of the valve, there is an extension spindle allowing the valve to be operated (open/close) from street level. The valve and the extension spindle have metallic contact, and as sound is transported optimally through metal, this location provides optimal conditions for noise loggers. The extension spindle is fixed in a street cover – which is typically installed in the road or in the sidewalk. 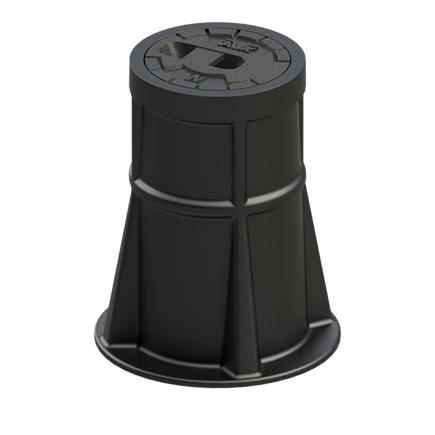 AVK has developed a plastic street cover allowing storage of the necessary equipment for noise loggers, like microphone, software installation, battery and antenna. Prior to installing the noise loggers, all valves in the selected area need to be checked to make sure that they are tight and function as intended. Then you need to decide where the loggers should be installed. In Klampenborg, 125 noise loggers have been installed and two leaks were identified just a few days after installation. It is unlikely that these leakages would have been found without the automatic loggers. At least not in the short term. One of the leaks was identified on a private pipe installation where the owner is usually responsible for the repair. In this case, it was fixed in cooperation with Nordvand, and the leakage was repaired in less than three weeks. The second leak was repaired within only one week after identification. Before the noise loggers were installed in Klampenborg, leakages were detected at manual inspection of the distribution network. In this area they had a systematic but manual inspection every second year. So, without the loggers it may obviously take a while before a leak is identified – in Klampenborg up to two years. During this period of time, the water loss will be a significant cost, and it should be taken into account that over time, a leak may potentially turn into a pipe burst and cause even worse and more expensive damage. Leakage management is therefore an important tool to reduce water loss as well as costs. Both Nordvand and HOFOR are already using automatic noise loggers at selected locations in their areas and as part of the LEAKman project, the whole Klampenborg district is now systematically monitored and on its way to absolutely minimise the water loss. The water distribution network is massive and it can be difficult to get an overview of all details. The pipe network in modern water distribution systems is therefore sectioned into smaller areas called District Metered Areas (DMA) including between a few hundred and a couple of thousand consumers. Each section has one primary entrance and a number of secondary entrances for use in emergencies. The sections need to be well defined and separated by shut-off valves – typically gate valves. It is extremely important that these valves are reliable and completely tight because otherwise you will not be able to know if water is lost due to leakages in the section or if it simply disappears to the neighboring section. The LEAKman project intends to demonstrate Danish solutions to reduce the water loss and to pave the way for new Danish water technology. It is a four-year project with a budget of DKK 43 m.
The goal is to establish some guidelines that can be implemented globally and help ensure stabile water distribution all over the world. We are nine partners working together on the project and besides AVK, Leif Koch A/S, NIRAS, Grundfos, Kamstrup, DTU, Nordvand, HOFOR and Schneider Electric have joined the partnership. AVK synthetic surface boxes are lightweight, user-friendly, easy to open, noiseless and maintenance free. Most of AVK surface boxes are designed and approved according to DIN/EN standards, but can also be designed according to local standards or customer specifications. For our customers, it is essential that quality and safety can be documented. This is where third party approvals come in, by establishing a range of requirements concerning valve components and finished valves.